The Duchy has submitted plans to open up the courtyard space, revealing former archways and previously unseen parts of the castle. The plans include the demolition of the current cafe and creation of a new cafe in the former prison kitchen and male felons wing. The former prison hospital will be stripped out to be used as a shop and ticket desk for tours, while another block will be developed into classrooms and meeting space. Work to create new workshop space will see the reinstatement of three original archways and the creation of three new ones. The work mainly focusses on the buildings to the right of the main entrance to the castle. The removal of the temporary cafe building would create a much larger space within the courtyard and there are plans for tree planting on artists impressions of how the development might look. The plans are part of the Duchy’s Phase 2: Envelope Repairs, Adaptations and Conversions, for the long term development of the castle. Graeme Chalk, head of project management for the Duchy of Lancaster, said: “Our focus is on continuing with our remedial works to make the castle buildings weather-proof and watertight. However, we remain committed to opening up as much of the castle as possible and have put these proposals forward to show how this might be achieved over the coming years. 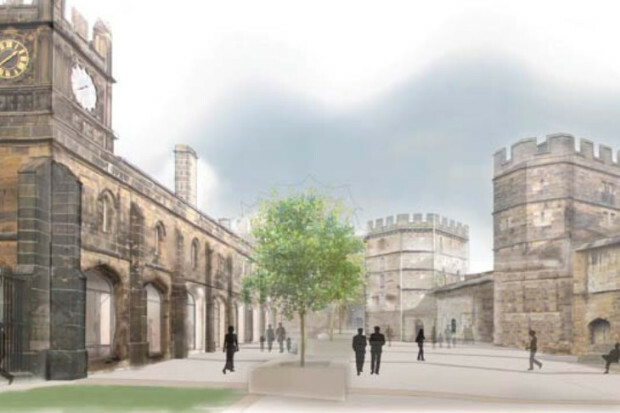 The Duchy of Lancaster has made a significant investment in the restoration of Lancaster castle since its return to Duchy ownership at the end of 2011.